The amazingly named Funny Band from Korean developer 3D-Oz solves the music game controller space issue either brilliantly or hilariously, depending on your point of view. Drums, guitar and keyboard in one controller? Indeed. But the keydrumtar isn't the real draw — and it's certainly not the online Rock Band knock-off — though seeing the thing in the flesh (after the jump) is horizon expanding. It's the press release that might blow your mind. 3D-Oz promises Funny Band "will be loved by dance game to lots of users who just fall in to rhythm game." Sure, it may be a Rock Band clone, but "there was no game like performing on on-line such as funny band." And yes, my Korean's not too hot, but do make sure to give the Korenglish-packed release a read. 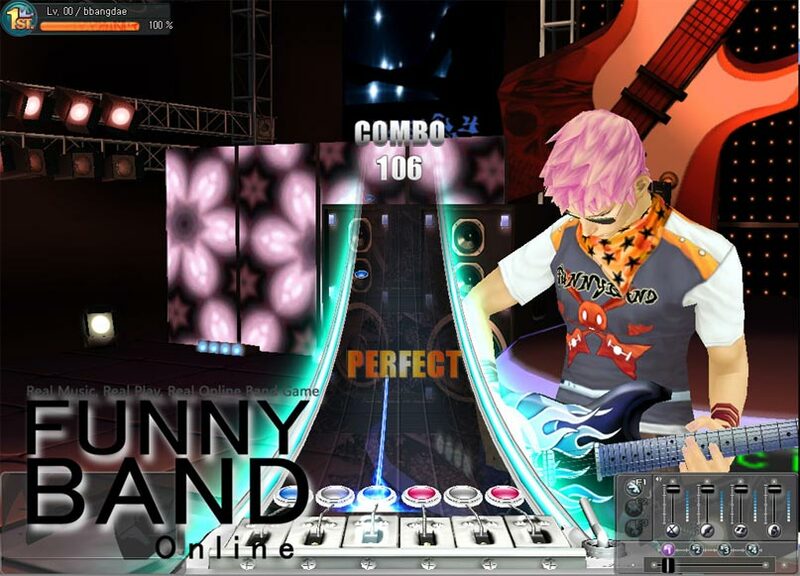 Real Music, Real Play, Real Online Band Game, It's "Funny Game"
Real music game has been exhibited through G star 2008 for users who disappointed by dance game which is disguised by rhythm game. We are expecting Funny Band which put slogan "Real Music, Real Play, Real Online Band Game" will be loved by dance game to lots of users who just fall in to rhythm game. Let's figure out the characteristic of Funny Band which is released by G Star experience session. First of all, Funny Band is using special sound system. You can use popular songs, pop, rock, and lots of rhythm music. All of those music are separated by position of guitar, drum, keyboard, and vocal as Funny band sound source so, user can freely adjust the volume of sound. Professional musician is playing each instrument and vocal sound therefore users can listen as real and there is benefit in reserve rights so, it will receive lots of interest from publishers who are preparing rhythm game line up. Moreover, we are expecting it will be loved for participating music game. Because after now, we can share compose and editing sound which armature musician is going to do and we are going to link with UCC. Second Characteristic is we can watch Funny Band as the first real on-line music band game. In the past, there were several cases some of games have received favour from some users by copying music band game. However, there was no game like performing on on-line such as funny band . Especially, vocal mode, the sound is made by 3D-OZ Corp.'s original voice streaming and technology of tone recognition so everyone can have fun with high quality at karaoke. Third, there is keynote system which has maximized the rhythm. Key point of rhythm game is touching sense during paying the game. Funny Band is music simulation game which provides keynote system from each instrument and music book. 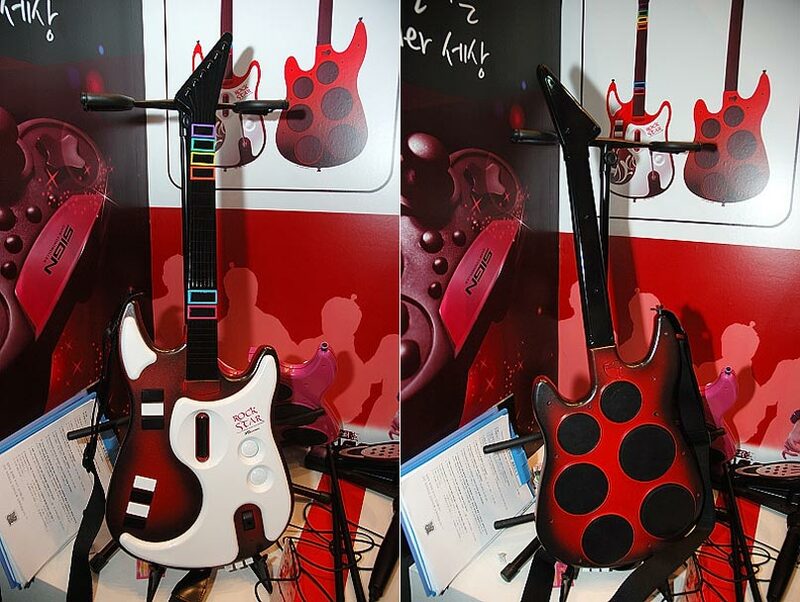 Specially, drum and guitar, users can have illusion for playing because instruments' quality is so fantastic. Furthermore, there is a level easy, normal and hard. So when you play easy mode, users who play rhythm game for their first time can easily adjust. Also, the multi controller for conquer Europe and northern America is going to have a huge boom to users who know the touching sense in rhythm music. Finally, there is community system that presents the factor of band. There are lots of cases that causal games are putting 3D community space in game reason for reinforce the community factor but there is not sufficient connection so they're receiving not much attention from users. However, in case of Funny band system, it can make band in 3D world space and activate more in azit by granting band space. Also it is almost same as off-line band because of community system such as competing with other band so it can grow up so it will receive lots of affection from users. Person from 3D-OZ Corp. said "we are going to listen various voices from users through G star experience session so the game is going to be innovated more high quality music game. Also, it is going to be a real music game that users can be participated and making together. Moreover, Funny Band is having lots of interest from middle area users and still connecting with our dominant publisher so, if it's early then we're expecting that we can play OBT service in beginning of next year.